After all the hype about the new MacBook Air releases, all the oohing and aahing over the engineering that slipped a significant amount of power and capability into such a tiny package, I was ready to be somewhat disappointed by the new 13.3-inch MacBook Air that arrived on my doorstep, recently. I've used [every MacBook Air since it was originally released], and I still use an 18-month-old Air for hours and hours every day. What could impress me about the new one? As it turns out, plenty. My last Air was top-of-the-line, with a dual-core 2.13GHz CPU, 2GB of RAM, and the 128GB SSD, purchased in June 2009. I purchased a top-of-the-line model this time as well, bearing the same dual-core 2.13GHz CPU, but now with 4GB of RAM and 256GB of flash storage ($US1799 from the Apple Store). The difference in performance between the two is significant -- and that's saying something. The older model -- my daily workhorse -- is no slouch, at least until you run into heavy swap due to the 2GB of RAM. After all, the old model has the same CPU is the new one. Still, applications like Mail, Safari, Microsoft Word, and others launch almost instantly on the new Air, and that's with Spotlight hammering the disk and CPU performing the indexing functions. The load average on the new Air is 1.85 with the Spotlight mds and mdworker processes claiming 150 percent of the CPU resources, and it's still easily beating the older Air in responsiveness. I should probably note here that I've had to disable the indexing services on many Windows 7 systems because indexing absolutely destroyed performance. I should also note that Spotlight was indexing around 100GB of data (transferred from my old machine) on the new Air (more on that transfer later). A casual glance at the old and new Airs doesn't tell much of a tale. They closely resemble each other in size and shape, although the hinges on the new version appear to be much sturdier than those on the previous Air. A closer look shows that much has changed. Gone are the underbelly curves in favor of the straight sides, and thankfully the new Air vents out the rear, not at a 45-degree angle toward the bottom. There are now two USB 2.0 ports (one on either side), a SD card slot, a Mini DisplayPort, and a flat MagSafe power connector on the left-hand side. The additions of the second USB port and the SD card slot are certainly welcome, and the fact that you can finally use any Apple MagSafe power adapter with the Air laying flat on a table is long overdue. It was one of my biggest pet peeves of the older version. The keyboard is no longer backlit, and the colouring of the keys is a little peculiar, seemingly more grey-on-charcoal than black-on-white. Frankly, I didn't expect that the lack of backlighting would bother me, but I've found that I miss it. The trackpad is the much larger button-free glass pad found in MacBook Pros (definitely a welcome addition), and the Air finally has stereo speakers, albeit tiny and tinny ones. Still, they're an improvement over the mono speaker in the previous model. Then there's the screen. At 1440 by 900 pixels, the 13.3-inch Air's screen has the same resolution as the 15-inch MacBook Pro, and it's fantastic. I've always thought that Apple wimped out on providing higher-resolution displays on its laptops (and I always bought the HD versions of the MacBook Pros), but this resolution on this screen is just right. Atop the screen is the newly dubbed FaceTime camera, but gone are the ambient light sensor and the microphone that adorned either side of the camera on the previous version. The microphone has moved to the left-hand side of the Air, next to the headphone jack, and the light sensor has apparently been hidden elsewhere on the case, though I couldn't immediately find it. That's all good, but it's the quickness of this new Air that is really impressive, and it's very much related to the new flash storage subsystem. Rather than wrap flash storage into an SSD and pass it through a standard disk I/O subsystem, Apple has directly integrated the storage with the mainboard, much like the iPhone and the iPad. The result is an extremely responsive computing experience: faster boot times, faster shutdown times, and faster everything in between. There are few things more annoying to me than waiting for a computer to do something -- it should wait for me, dammit. The new Air is easily the most responsive GUI computing experience I've ever had; most applications are up and running before their icon completes a single bounce in the dock. We aren't talking just Apple apps, but also Google Chrome, Microsoft Word and Excel, and so forth. Even notoriously chunky iTunes takes only a second or two to launch. Perhaps most telling is when you invoke the Dashboard after a clean boot. I happen to have 10 dashboard widgets installed, and they all need to start simultaneously after a fresh boot. On the previous Air (and other MacBook Pros), this takes several seconds at the very least. On the new Air, it takes less than one second. The new Air boots from off to a login prompt in about eight seconds, and shuts down in four to five seconds. It sleeps and wakes from what appears to be a new, deeper sleep mode instantly. It's very, very quick. I ran some sequential streaming read/write tests and consistently saw read speeds of over 160MBps and write speeds of over 145MBps while working with 1GB files. In comparison, the previous SSD-based Air clocked in at 35MBps writes and 97MBps reads on the same tests, though it should be noted that the SSD in the Air has seen plenty of action over the past year, which may have influenced those numbers. But make no mistake: The storage juice in this Air makes everything faster, even versus the same CPUs as the last generation. If the 4GB of 1,067MHz DDR3 RAM is eclipsed and the system goes into swap, the speed and responsiveness of the flash storage makes swap far less noticeable than on any form of disk-based storage. Speaking of RAM, the new option of 4GB of RAM in the Air is long, long overdue. It was my single greatest complaint about the previous versions -- 2GB simply is not enough RAM for this day and age. I'd have really liked to see an 8GB option, but 4GB is the max, and as with the previous models, it's not upgradable. 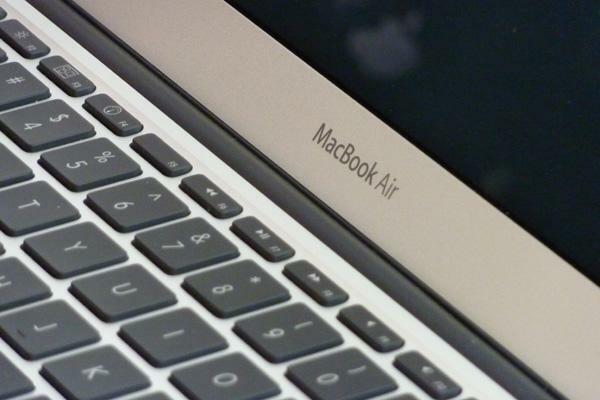 The new Air also has no power light at all, unlike all the other MacBooks in existence. I suppose this is because Apple doesn't want you thinking about the concept of on versus off, since the batteries last so long in standby mode. The iPad and iPhone don't have power lights, and the Air is clearly borrowing from those devices. As far as battery life goes, with full brightness, Wi-Fi enabled, and general usage (that is, no extremely heavy CPU- or storage-intensive tasks), the claimed 7 hours is more or less accurate. With normal use -- Web browsing, watching some Flash video, writing, a pile of X terminal sessions, some RDP clients, mail, IM, and whatnot -- I got 6.5 hours of battery life. Dropping the screen brightness naturally increases runtime. I obviously haven't had the opportunity to test the claims of 30-day standby time. I did note that the new Air charges from flat to full in well under 2 hours, and even 5 minutes of charging added about 20 minutes of runtime, which is good news for the traveler. I always feel that it's important to note how Apple makes system migrations so simple. Those who haven't experienced upgrading from one Mac to another are generally shocked at how smooth and easy the process is. In the case of my Air-to-Air migration, I simply connected them with the $29 USB Ethernet adapters and a length of Cat5e cable, booted the new Air for the first time, and started the Migration Assistant on the old one. It took about 2 hours to migrate 100GB of data from one to the other over the 100Mbps Ethernet dongles. Following that, I was immediately able to log into a session on the new Air that was completely identical to the old Air, with all my preferences, applications, documents, and settings already there and waiting for me. Needless to say, it would take far, far longer than 2 hours -- and cause significant frustration and stress -- to replicate all of those settings, reinstall all of those applications, and copy all of those files manually. As impressed as I might be with the new Air, there are a few issues, but they're exceedingly minor in the face of the stellar performance. First is the aforementioned lack of a power light. Call me old-fashioned, but I like to know if my laptop is on or off. Another minor quibble: Even though the power port is now horizontal and flush with the left side, the power adapter is still angled at 45 degrees. In one position, it blocks the USB port on that side. Flipping it over is easy enough, but it can be a pain in some situations where the cable needs to bend back toward you. Inexplicably, there's no remote IR receiver anywhere on the new version, so if you want to use your Air for presentations, you'll need to purchase a Bluetooth presentation control accessory or use an iOS device connected via network -- bummer. Finally, the reliabilty of the flash-based storage subsystem remains to be seen. Given Apple's track record with flash-based devices like the iPad, iPod, and iPhone, I have to believe the company gave plenty of thought to the dependability and longevity of the SSD, but the usage models for those devices are far different than for a Mac OS X-based laptop. Mac OS X does not implement TRIM, which handles wear-leveling and garbage collection to prevent SSDs from slowing down over time. It's unclear whether that or a similar technology will be necessary for maintaining the new flash-based storage in the Air, but time will tell. Given the spectacular responsiveness of the new MacBook Air, it's a good bet that the next run of MacBook Pros will sport the same flash-based storage with beefier CPUs, greater RAM support, and larger screens. But they'll also be bigger and heavier - and that's where the Air stands apart. It has the oomph to handle just about every general-purpose task you can throw at it while weighing in at less than 1.5kg. I'm not going to use my Air for heavy video editing with Final Cut Pro or to mix down 32 audio tracks in Pro Tools, but I'll reach for it when it comes to all of my other daily tasks, wherever I happen to be. One thing's for sure: This Air is easily the best one yet.